From the moment Princess Leia’s Corellian corvette blasted on-screen, I was hooked on Star Wars. Well, I imagine I was—I don’t even remember the first time I saw A New Hope. It’s as though I was born liking the movies. The worlds in those movies were so alien yet so real that I couldn’t help but be captivated. It wasn’t until years later when flipping through one of my uncle’s books on the series that I discovered the man behind the original trilogy’s distinctive look—Ralph McQuarrie. McQuarrie was the conceptual artist that shaped the ships, weapons, and worlds of Star Wars. Unfortunately, he passed away this weekend. 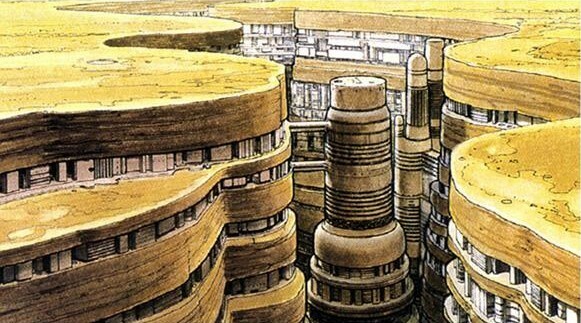 McQuarrie used the fantastical universe to dream up cities that dazzled my imagination. They were—to my young eyes—visions of urban agglomerations that pushed my understanding of what cities could be. Obvious examples include Mos Eisley on Tatooine, its buildings sunken and topped with duracrete domes to fight the intense heat of the planet’s twin suns, and Cloud City on Bespin, the improbable floating saucer-atop-a-spire that was filled with airy hallways and gusty landing pads. The more I dug, the more brilliance I found. Left on the cutting room floor was art for Aldera, and even a skyline for Coruscant before George Lucas even gave planet a name. Another that sadly didn’t make it was Crevasse City on Alderaan, pictured above. After seeing it’s buildings neatly tucked into cliff-faces, it dawned on me that cities don’t have to be discordant with their landscape. Wookiepedia has an expansive gallery of McQuarrie images.